Nose Bleed Island, Hello Shark and Palatypus at Radio Bean, Saturday, February 16. Led by the emergence of acts such as The Capstan Shafts and new releases by local stalwarts such as Ryan Power and Colin Clary, 2007 was a banner year for Vermont's indie-rock scene. But perhaps no group made quite as big a splash as Joey Pizza Slice and his outlandishly kooky collective Nose Bleed Island. Their album More Tales From The Blood Island was one of the finest releases of the year - indie or otherwise - and garnered the band a feverish cult following among Burlington's most discerning hipsters. With pals Miss Marple, Dracula, Z-Bear and Robot in tow, 2007 was the year of the Nose Bleed. But 2008 has been curiously quiet thus far, at least where Nose Bleed Island is concerned. Pizza Slice, Marple and Robot left Burlington for a spell in December, playing coffeehouse gigs and house parties around the country. Meanwhile, the band's growing legions of local fans were left to twiddle their thumbs. Well, guess what? Nose Bleed Island is back, and stranger than ever. On a recent Saturday night, Burlington's Radio Bean was positively overflowing. As the soothing acoustic strains of Albany's Palatypus emanated from behind the cozy coffee shop's frosted windows into the street, a throng of black-rimmed-glasses-clad folks stood huddled in front of the door, bracing themselves from the cold. The "bouncer," a petite and attractive young woman wrapped cocoon-like in a fleece shawl, politely tried to maintain some semblance of order, as an increasingly colder group of hipsters grew increasingly impatient. "We're at capacity," she repeatedly explained to the pleading - and freezing - masses. Once inside, the scene was no less frantic - but infinitely warmer, at least. I made my way through the densely crowded café, just as Boston's Hello Shark piled onto the stage, which is notoriously small. It's not unusual for bands to employ rather creative means of squeezing everyone in. Members of the sextet stood on chairs, sat on the floor and huddled around microphones. Given the improvised and ramshackle setup, their sound was impressive. 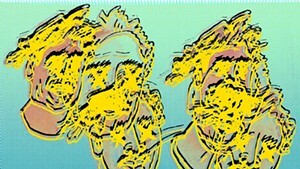 The group is reminiscent of early Modest Mouse, if it were fronted by Lou Reed. It's a pleasant, if not altogether unique, sound, but the crowd was enthusiastic. Radio Bean is also notoriously liberal with set times, and the night's lineup was already well behind schedule. As such, Hello Shark's set was short and sweet. Nose Bleed Island took the stage at around 12:30 a.m - a good hour and a half after the advertised start time. Consider it part of the Bean's charm. Given the late start time, there was no sign of the band's 11-year-old drummer, Z-Bear. Joey Pizza Slice and Miss Marple were joined only by Robot - who is, in fact, a toy robot. Who knew? They opened with an energetically unkempt version of "Pteradactyl" from More Tales. Part of that album's appeal is that, despite its eminently quirky material, it's impeccably polished, not unlike much of The Flaming Lips' later catalogue. The recorded songs exude an endearing innocence and are simultaneously off-kilter and immaculately performed. Nose Bleed Island's live show was anything but. From the outset, the crowd erupted in an all-out dance-party frenzy. Bouncing hipsters mouthed lyrics, feeding off Pizza Slice's frenetic energy. The front man's stage presence was as disheveled as his hair, which is saying something. Even wearing a plush McDonald's french fries costume, Miss Marple was almost demure by comparison. Not that the performance was disappointing. 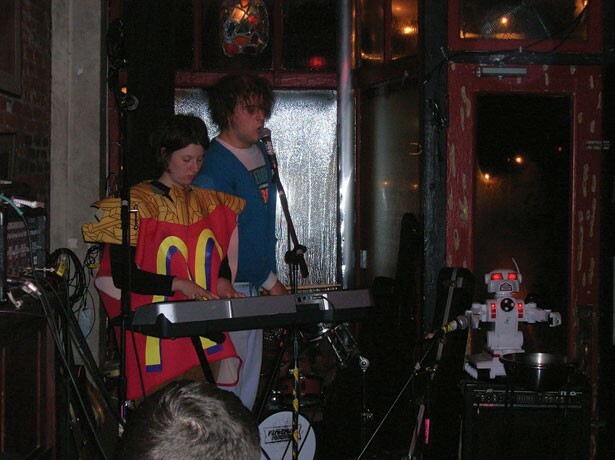 To the contrary, the pair - er, trio (sorry, Robot) - served up a thoroughly engrossing live show, offering an unfiltered glimpse into their wide-eyed, childlike madness. Pizza Slice simultaneously strapped on a guitar and a single-stringed bass, plucking the strings of both instrument with each hand on "Where Do Birds Fly?" Marple held her miniature drumset against her chest as Pizza Slice banged out hyperactive rhythms and sang on "Pizza Planet." The crowd exploded with glee on "Nazi Tears" as the 6-foot man-child sang about "getting blow jobs from [the Nazis'] moms." He then ate a $20 bill before launching into the finale: Frank Sinatra's "Strangers in the Night." Nose Bleed Island is certainly not your average indie-rock band, and they certainly don't put on your average indie-rock show. But as people began filtering out, more than a few folks could be heard humming their melodies, including the door girl as she helped clean tables. While their live show might not appeal to as wide an audience as their recorded material, fans of More Tales From The Blood Island would nonetheless do well to catch the band in a live setting, if only because you're unlikely to see anything like it. You might not want to bring cash, though.